This is a common large woodpecker. Adults average 12½″ to 13″ in length with a 20″ wingspan. The body and wings are grayish-brown. The wings and back are barred. The tail is black on the top. The underside of the wings and tail are yellow. The rump, only visible in flight, is white. The breast and belly are buff to whitish and are heavily covered with black spots. The breast has a large black crescent. The crown and the nape of the neck are gray. There is a bright red crescent on the nape of the neck. The chin and throat are tan. The face is brownish to buff. The male has a prominent black mark behind the bill usually described as a “mustache stripe.” The bill is long. The song is a loud and rapid wick-wick-wick-wick-wick-wick. Mourning Dove (Zenaida macroura) is similar in size and shape but not in coloration. When flying away it does not show a white rump. Mostly ants found on the ground. Also other insects, including grasshoppers, crickets, termites, wasps, aphids, beetles, beetle larvae, and caterpillars; spiders, In late fall and early spring they also eat cherries; berries, including dogwood, Virginia creeper, poison ivy, sumac, and hackberry; and nuts, including acorns. Overwintering individuals regularly visit suet feeders. Between February and July the male and female join together and excavate a new nest usually in a dead or dying deciduous tree, sometimes in a telephone pole or fence post. Less commonly, they will repair and reuse an existing cavity or use a birdhouse. Excavation takes about 2 weeks. The female lays 5 to 8 large, glossy white eggs. Both sexes incubate the eggs for 11 to 16 days, and after hatching, both sexes feed the young. Fledglings leave the nest 25 to 28 days after hatching. This bird is often seen flying away from the observer, making it impossible to see the head and neck markings. In these situations the white rump, conspicuous in flight, is the most useful identification mark. 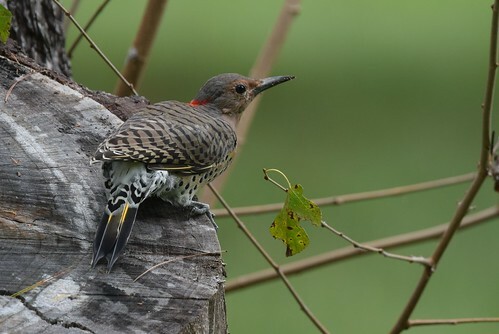 In 1995 the American Ornithologist’s Union (AOU) split the Northern Flicker into two species, Northern Flicker (Colaptes auratus) and Gilded Flicker (Colaptes chrysoides). Some authorities, including the International Ornithologists’ Union (IOU), recognize ten subspecies (nine extant, one extinct). 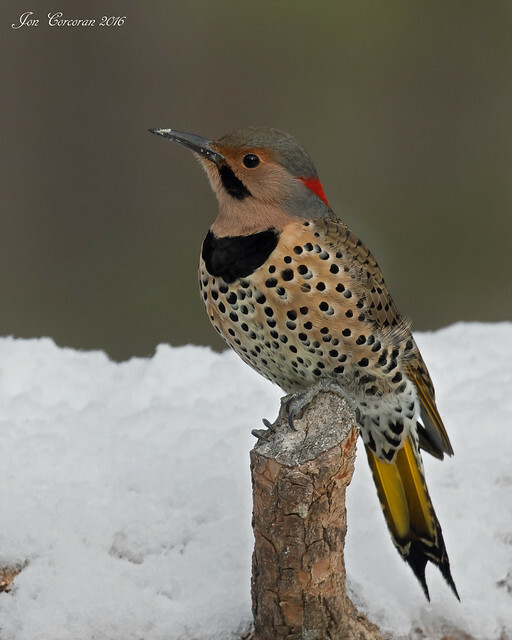 In this classification, Yellow Shafted Flicker (Colaptes auratus luteus) is the only subspecies found in Minnesota. Other authorities recognize only two subspecies. In this classification, Yellow Shafted Flicker (Colaptes auratus auratus) is the only subspecies found in Minnesota. Northern Flicker (Yellowtail) at Breezy Point Resort 2011. Seen on the point north of the resort on Pelican Lake. This short video documents the lives of Northern (Yellow-Shafted) Flicker family over a 2 month period. 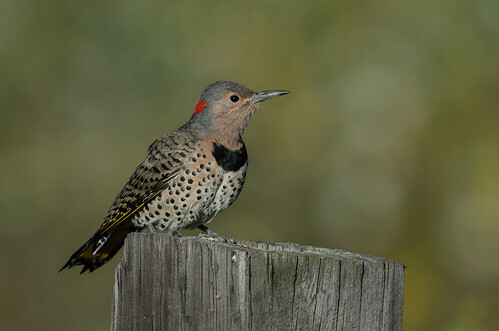 Northern Flickers are ant eating woodpeckers that have a strong preference for nesting in tree cavities. Key Points: the stll at ~1:45 is a rare capture of the pair mating on a branch. The still at ~1:50 is an important part in the fledging process where the parent arrives at the nest to feed it's chicks and only feigns the feeding in hopes of luring it into leaving it's friendly confines. This causes the chicks to react aggressively in the midst of their hunger pang and the resultant a good peck to the stomach of the parent. If you look closely @ 7:33 and just after the chick's seventh chirp - you will see it fly from the nest. The still immediately following is of another chick leaving the nest. I have three of them hanging out. My first sighting of a Northern Flicker! He was eating "hearts and parts" bird seed out of my Squirrel Buster Plus feeder.